Boil grated kaddu in water or milk to almost done. Dry basmati rice on a soft cotton cloth then grind it to granuales and keep aside. Boil milk and add cashewnut paste,basmati rice,saabudana. Keep stirring every now and then. Add elaichi powder,few saffron strands. When the rice is almost done add cooked kaddu to it and cook till desired consistency(it should be thick). Finally add sugar,khoa,vanilla essence,green colour to it. Garnish with almonds and serve chilled . Salam...after a long time its a nice post..keep up your good work. wats the substitute for khoya? 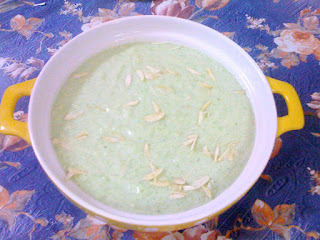 The kheer looks great..nice blog and love to follow u. It looks so creamy, I have bookmarked it to try out soon. One of my favorite meethas. Looks yummy. Anjum! This looks delicious, back after a long time but trying to visit all blogs. yours tempts me to make this. its very nice..nd easy to cook.. The quantities I mentioned are for 5 people , and if you need for 30 people please calculate accordingly. Instead of making in such a big quantity , I suggest you make 2 different deserts to simplify the job and also have variety. hi anjum this recipe is so good i was tried at home my all family members r appreciate it and they all enjoyed to eat it .and its easy to make thnku . hi anjum this recipe was so good i was tried it at home and my family members r appreciate it and loved to eat it .thanku so much. Anjum, tried the recipe. I usually make it with milk, sabudana, sugar and condense milk. But the additions you suggested added a far more royal taste. Especially the kaju. Thank you! I suggest 200 gms khoya for one ltr milk for a rich taste. Similar quantity of qalaqand or full fat milk powder can be used, if khoya is not an option. Essence & color are best to be added when the kheer temperature comes to room temperature or below. Garnishing with cherry & fruits (dried papaya) will definitely enhance the taste. Custard powder can be an option, if rice powder is not available. Assalamwalykum ..Got lots of appreciation..jazakallah.